If you are tired of looking at your stale, outdated bathroom and are finally ready to do something about it, do not fret. 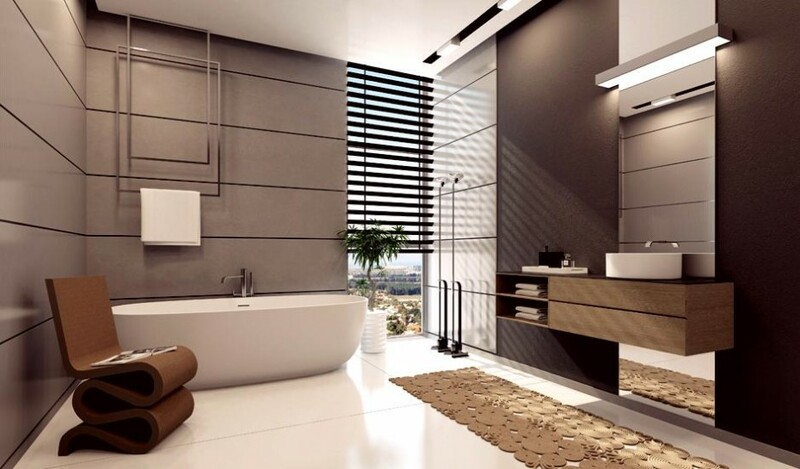 There are a number of different ways you can design a sleek contemporary bathroom by just making a few simple changes and alterations. Contemporary bathrooms are growing in popularity, and you can choose a style that is simple and utilitarian or attempt full-blown elegance. You can decide to undergo a complete overhaul, or simply make your bathroom a bit more contemporary by installing new faucets and hand held shower heads. Starting with the sink, you can significantly enhance your bathroom’s look with a new faucet. Brass faucets are an excellent option for a contemporary feel, as they tend to stand out and look elegant against the contrast of a traditional white sink. You can find these in a wide range of styles, from antique to sleek and modern. Next, upgrade your shower by installing either hand held chrome shower heads or hand held massaging shower heads. One good idea might be finding a shower head that nicely compliments your new faucet. Create additional storage space in your bathroom by adding attractive wicker storage baskets and clothes hampers. Cap off your new contemporary look by installing stylish new lighting that compliments your bathroom’s decor. With so many options to choose from, designing an appealing contemporary bathroom is easier than you may think, and it is often a fun process. Decide on a style or look that suits your tastes and begin acquiring the hardware and accessories that are sure to alter the vibe of your bathroom for the better.